Faint remnants of ancient Earth’s magnetic field have been found imprinted on the oldest rock crystals in the world—evidence that the magnetic dynamo in our planet’s core was alive and kicking more than 4 billion years ago, more than half a billion years earlier than scientists had thought. 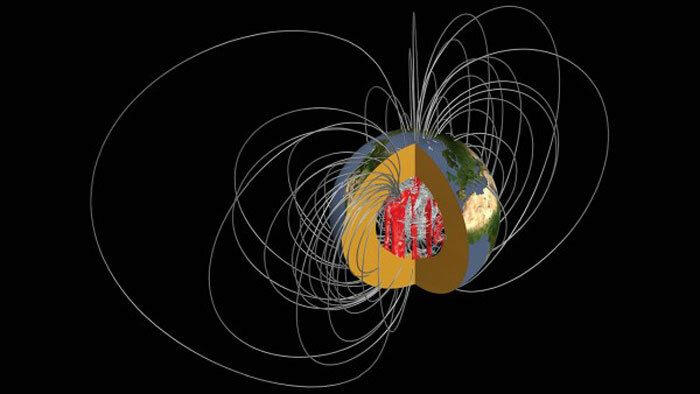 An early dynamo would have helped life gain a fingerhold: Earth’s magnetic field shields it from the solar wind, a stream of energetic particles from the sun that could strip the planet’s atmosphere of water vapor and other gases necessary for life. “If we know when the magnetic field starts, we have a good sense of how long the Earth has been habitable,” says Rory Cottrell, a paleomagnetist at the University of Rochester (U of R) in New York. Cottrell, U of R paleomagnetist John Tarduno, and other colleagues publish their controversial evidence for an ancient dynamo today in Science. The ancient age has other important implications. Scientists who model the dynamo—which arises as iron in Earth’s liquid core freezes out and cools via convection—will be surprised by the findings because their models generally predict a dynamo beginning within the past 3.5 billion years. The revised age could also bolster evidence for an early start to plate tectonics, which is thought to have begun around the same time as the dynamo. In plate tectonics, moving slabs in the crust and upper mantle cool the mantle via convection, an efficient way of cooling in which hot buoyant material rises, cools off, and sinks again in a circulatory pattern. A cooler mantle would in turn provide a cooler outer boundary for the core, a necessary condition for its own convection to begin and kickstart the dynamo. But the study has already created some controversy, with a rival group saying they can’t reproduce the results of Tarduno’s group. Given the overall importance of the dynamo’s age, the discrepancies are worth sorting out, says Joseph Kirschvink, a magnetist at the California Institute of Technology in Pasadena and a co-author on the rival study. “When you get two groups looking at the same rocks, from the same place, and getting drastically different results, it’s a little startling,” he says. The Science study began with rocks collected 5 or 6 years ago from the Jack Hills in Western Australia. Mineral crystals in the rocks, called zircons, are hardy things, nearly impervious to time, and many of them have ages of more than 4 billion years—evidence for the oldest rocks on Earth (the zircons originally crystallized in rocks that have long since disappeared). Now, the zircons sit within quartz pebbles within a mish-mashed stone, called a conglomerate, that formed about 3 billion years ago. Tarduno brought a sample a quarter-meter across from the Jack Hills back to his lab and crushed a portion of it. Using optical microscopes, his team painstakingly searched for zircons about 0.2 millimeters across. Typically, magnets are used to sift for zircons, which contain magnetizable minerals such as magnetite—but that would have altered any remanent field in the zircons. The team found several thousand zircons in the sample and selected several hundred that lacked cracks and seemed the most pristine. In a special room shielded from the Earth’s magnetic field by layers of steel and nickel, the researchers put the zircons through a magnetometer—one that works something like an MRI machine except the central tube is less than a centimeter across. The magnetometer, which uses cryogenically cooled superconducting sensors, identified the strength and the orientation of the Earth’s ancient magnetic field when it was “frozen” into magnetite crystals within the zircons. The team sent the best zircons off to another laboratory to get age dates. In the end, the team found quality dates for 44 zircons with an ancient field; the oldest is 4.2 billion years old—750 million years older than the oldest previous estimate of the Earth’s magnetic field based on zircons. But Tarduno’s team also had to demonstrate that the zircons had not been remagnetized at any point in their history. Hot fluids or ambient heat can reset an imprinted magnetic field if the temperature of magnetite rises to 585°C, its Curie point—the temperature at which magnetic fields are set in the mineral. So the team cut a thin section out of their 3-billion-year-old conglomerate sample, and showed that the magnetic orientations of areas containing zircons were all oriented randomly. If the rock had been remagnetized in the past 3 billion years, it is likely that the orientations would have been aligned. Then they had to worry about the zircons’ first billion years or so of existence. The researchers argue that if heat remagnetized the zircons during this earliest period, they would have detected a discrepancy in the uranium-lead radioisotope system used for dating the zircons. But a group led by Ben Weiss, a planetary scientist at the Massachusetts Institute of Technology in Cambridge, has serious doubts about the Science study. In a paper in press at Earth and Planetary Science Letters, Weiss and colleagues specifically call into question some of the results. They have analyzed zircons from the same area of the Jack Hills. They have found evidence for alignment of magnetic orientations within the rocks, which they say is due to a volcanic event nearby that would have brought heat to the rocks about 1 billion years ago. “We have not yet found what we can defend as primordial magnetization,” Weiss says. Tarduno is undeterred by Weiss’s skepticism. “Our conclusion is that they haven’t even measured the magnetization that we have,” he says. Much of the debate comes down to the nuances of the different magnetometers being used. Tarduno says the one his group uses is 10 times as sensitive as a typical magnetometer used for this sort of work and is also better at detecting 3D magnetic orientations. Weiss retorts that his group is now using a magnetometer based on quantum diamond sensors that offers better spatial resolution than ever before. At a meeting of the American Geophysical Union in December 2014, a collaborator of Weiss’s used the diamond-sensor magnetometer to show the specific part of an ancient zircon where the magnetization may lie. It turned out it was coming from ferromagnetic materials coating the surface of the zircons, not from magnetites in the interior of the crystal. That’s another sign that these zircons can be contaminated or altered easily, Weiss says. Tarduno says he is glad that Weiss is pushing the limits of these measurements, but does not think that that particular result says anything about the zircons his team selected. “I don’t think it bears on our samples,” he says.